In the years from 1866 to 1890 the Great Plains of the American West were home to over five million cattle. 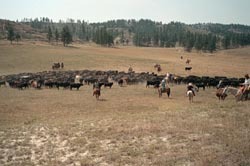 The cattle survived on the "open range" or public domain lands of Kansas, Nebraska, the Dakotas, Wyoming, and Montana. Cattle trails went from western Texas northward, through Indian Territory, to the Great Plains of Montana. At the end of the Civil War there was a shortage of beef in the North. With the South in ruins, Texas was the only source of cattle. Cowboys rounded up, branded, and drove wild longhorn cattle north to Kansas for shipment to the Northeast, and on to Montana where the boundless open spaces and vast grasslands of the eastern plains served as pastureland for the animals. At the time "Cow country" was all but free from farmers with their barbwire fences and grass-eating sheep. Cowboys, accomplished horsemen skilled in the use of the lariat, saddle, spurs, and branding iron, pushed the longhorns north and maintained the herds. Cattle were managed most efficiently in herds of about 2,500 "head." About eight to twelve wranglers were used for each herd. Each day they traveled about ten to twelve miles. Some steers were natural leaders so they would be used as lead steers on several trail drives. The trail boss searched for places where the cattle could graze and be watered. River crossings, storms, and stampedes were just a few of the dangers cowboys faced on a trail drive. At night, the men took turns riding around the herd, two men at a time, moving in opposite directions. They sang as they went, and though their music may not have been pleasing to the human ear, it was soothing for the cattle. It kept them from getting spooked and stampeding. Many old traditional western songs were said to be centuries old sea chanteys with new words appropriate for the American West. In the autumn cowboys rounded up the cattle, including strays, from the open range and branded those not already branded. In the spring they cutout the cows ready for market and drove them to the nearest railroad town, often hundreds of miles away. There the cattle were sold to eastern buyers and the cowboys enjoyed a brief period of relaxation before returning home to begin the routine of another year. On roundups and trail drives, cowboys slept outdoors for weeks at a time. Their bedroll often consisted of a pair of blankets rolled in a piece of oiled, waterproof canvass. Inside his bedroll, he kept extra clothes, letters, and other personal items. The bedroll was the cowboy's personal bedroom on the prairie. At night the cowboys told stories around the campfire or listened to fiddle or harmonica music. Wake up time was often four o'clock in the morning. Each morning the cowboy had to make his bed and load it on the chuck wagon, or the cook might leave it behind. 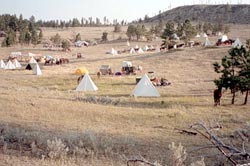 The chuck wagon moved ahead of the herd to the night's camp. Meals for the cowboys came twice a day, once before dawn and again after dark. The men said they had two suppers. Cowboys ate a lot of beans, biscuits, rice, dried fruit, and beef but almost no fresh vegetables, eggs, or milk. The Longhorns thrived on the open range and the government banned the fencing of lands but the severe winter of 1886 to 1887 virtually wiped out the herds. Many of the once-profitable cattle companies were ruined as hundreds of thousands of cattle perished in the heavy snow and frigid temperatures. The industry never recovered. As cattle raising dwindled homesteaders began pouring into the plains country to fence the land, bust the sod and grow grain on dry land. The open range was transformed into farms and cattlemen began to settle on ranches with barbwire boundaries. While genuine cowboys remained to work the ranches of Montana the cowboy legend, typified by the reserved, self-reliant hero of the west, has grown in American folklore from the dime-store novels, of the early twentieth century to the modern motion picture hero. Today, everyone can experience the adventure and true romance of the American West on a Montana cattle drive. 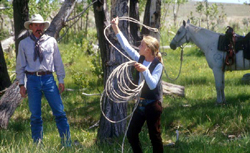 You can spend three to five days working on a real ranch. Ride with genuine cowboys, share their work, and learn about their way of life. On the cattle drive you'll work 400 to 1,000 head of cattle, stretched out over a mile along the trail. Some days you might be in drag position (end of the herd), other times you'll be on the flank (side of the herd). In the evening you'll help care for your own horse and bed down the herd for the night. If you prefer not to ride a horse you can travel in one of the horse drawn wagons that follow the cattle drive. As a rule you won't see a motor vehicle for the entire trip. A day in the saddle will help you work up an appetite for thick steaks, biscuits and beans served up from the chuck wagon. After dinner, you can listen to live western music and swap trail stories under the stars. Finally, the call of the distant coyote will lull you to sleep. In the morning you'll wake to the aroma of flapjacks and eggs as you watch the wranglers catch the horses and prepare for another day on the trail.